These fields are where "Pickett's Charge", the last Confederate attack of the battle occurred. Almost one mile of open ground lay between Seminary Ridge in the distance and Cemetery Ridge in the foreground. Confederate soldiers of General A.P. Hill's corps and General James Longstreet's corps occupied the distant woods on July 2, the trees screening the movement of artillery and infantry into position to prepare for the afternoon's assault on the Union left flank on Cemetery Ridge, which began at 4 PM. 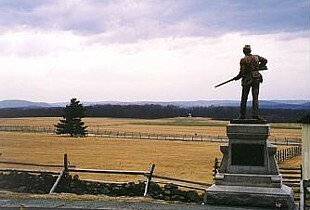 Only Confederate skirmishers were observed in these fields until 7 PM when General Ambrose Wright's Georgia brigade advanced from the woods across this wide plain, striking Union troops centered around the Codori House on the Emmitsburg Road. Though initially successful, Wright's men could not penetrate the Union line and were thrown back with severe losses. At dawn of July 3, these fields and pastures were full of troops from both armies engaged in heavy skirmish fighting that lasted throughout the morning. Promptly at 1 o'clock, two Confederate cannon of the Washington Artillery of New Orleans were fired as a signal to begin the artillery bombardment prior to the infantry assault. Approximately 120 southern cannon suddenly came to life, sending shot and shell into the Union line on Cemetery Ridge. Colonel Edward P. Alexander recalled, "In another minute every gun was at work. The enemy were not slow in coming back at us, and the grand roar of nearly the whole artillery of both armies burst in on the silence, almost as suddenly as the full notes of an organ would fill a church. The enemy's position seemed to have broken out with guns everywhere and from Round Top to Cemetery Hill was blazing like a volcano. The air seemed full of missiles from every direction." For forty minutes the deadly duel with Union cannoneers on Cemetery Ridge continued with no let up in the volume of shells or ear-splitting blasts. The sound of the cannonade was so loud that it could be heard as far away as Harrisburg, Pennsylvania, a distance of 40 miles. 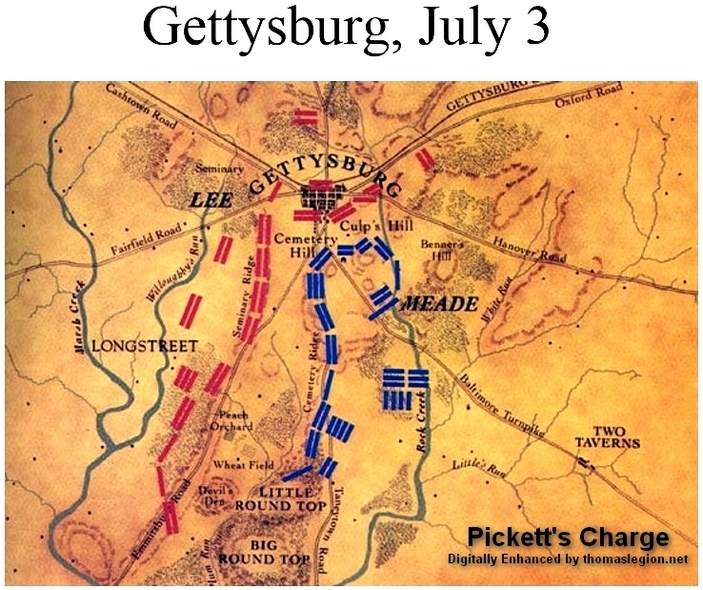 Battle of Gettysburg concludes with Pickett's Charge on third day. 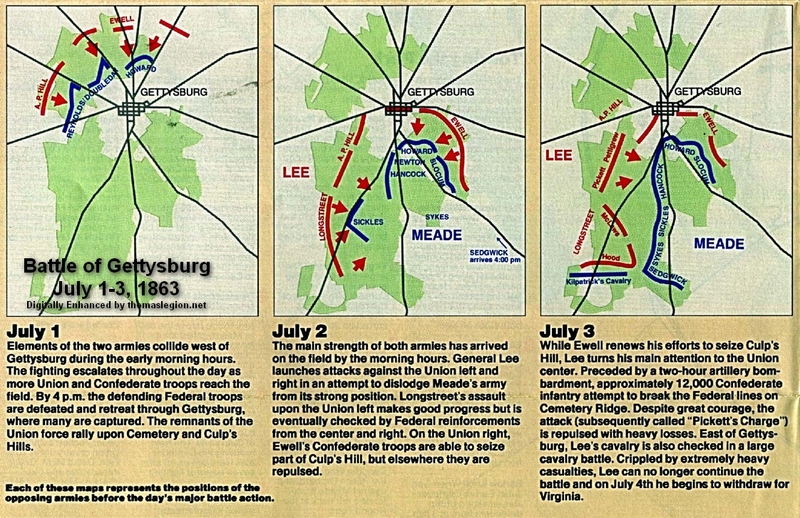 (Right) Enhanced map showing action at Gettysburg on the third and final day of the fight. General James Longstreet was tasked with command of the infantry in the last great charge of the battle. General George Pickett's Division of Virginia soldiers, General Heth's Division (commanded by General J.J Pettigrew), and two brigades of General Pender's Division (commanded by General Isaac Trimble), approximately 12,000 infantrymen, would make the initial charge. The troops would be followed by reinforcements including General Cadmus Wilcox's Alabama brigade and Colonel David Lang's brigade of three Florida regiments. General Lee's last gamble for victory at Gettysburg now rested in the hands and hearts of these southern infantrymen, about to enter into one of the most desperate and famous charges in American history. After forty minutes of cannonading many of the Union guns fell silent by order of General Henry Hunt, artillery chief of the Army of the Potomac. The slackening of fire was mistaken by Alexander for a general withdrawal and he scribbled a note to General Pickett: "For God's sake, come quick... come quick, or my ammunition won't let me support you properly." Pickett carried the message to General Longstreet, seated on a fence in Spangler's Woods near the location of the Virginia Monument. Sad and bitter, Longstreet could barely a nod a reply. The dashing Pickett rode off to order his men forward while Longstreet remained on his fence, preferring not to watch the disaster about to befall his troops. 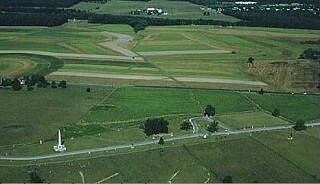 (Left) Photo of the field of Pickett's Charge. Pickett's, Pettigrew's, and Trimble's commands marched from the distant line of trees to Cemetery Ridge, breaking the Union line at the Angle and "High Water Mark" in the foreground. Courtesy Gettysburg NMP. "Up men and to your posts," shouted a joyous General Pickett. "Don't forget today that you are from Old Virginia!" His men cheered as they rushed into formation. "Before us lay bright fields and fair landscape," a Confederate staff officer remembered as the southern infantry stood in perfect order, prepared to cross the mile of open farmland. At the command of "forward, march! ", the huge formations moved, each regiment distinguishable by the red cloth battle flag of the Army of Northern Virginia. This massive parade was suddenly rained upon by a shower of artillery shells as Union guns came back to life. Explosions ripped through the Confederate ranks. Officers waved swords and shouted above the noise for the men to close the gaps. Guided by their flags, the southerners continued on toward Cemetery Ridge. It was over within an hour. These fields were soon covered with the survivors of "Pickett's Charge", some staggering from wounds and shock, some walking quietly with little reaction to the chaos around them, and some near panic. Accompanied by Sir Arthur Fremantle, an observer from the British Army, General Longstreet rode among them and spoke kindly to both officers and men. Fremantle also saw General Lee speak to the shocked survivors of the charge. "All this will come out right in the end," the general said. "We'll talk it over afterwards; but in the meantime, all good men must rally. We want all good and true men just now." Today these quiet fields are traversed by hundreds of park visitors eager to walk the same historic line of march where so many tramped to their deaths on that hot July afternoon. The trail begins at Spangler Woods near the Virginia Monument and takes visitors across the mile of open field, across the Emmitsburg Road and up to the "Angle", the central piece of contested ground. Here stands the small grove of trees- a mere clump of scrubby trees and brush in 1863- that forever after has borne the name of the "High Water Mark". 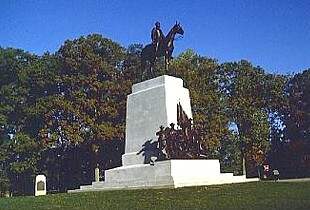 Located near the center of Seminary Ridge, the Virginia Monument is one of the largest southern monuments in the park and features a heroic-size equestrian statue of General Lee atop Traveller, his favorite mount. On the base of the monument is a grouping of bronze figures representing the various backgrounds of the soldiers who served under Virginia's flag. All of the figures are the work of sculptor F. William Sievers (1872-1966), whose outdoor artistic work also includes two monuments in Richmond. The monument was unveiled and formally dedicated on June 8, 1917. This location for the monument, overlooking the fields of Pickett's Charge, was selected because it was here that General Lee witnessed the disastrous charge. Even in defeat, Lee was magnanimous. Rising to the greatness that has symbolized him throughout history, the general placed full blame for the failure squarely on himself. To a distraught General Pickett, Lee spoke words of comfort: "Come, General Pickett, this has been my fight, and upon my shoulders rests the blame. The men and officers of your command have written the name of Virginia as high today as it has ever been written before." It is no wonder that the Confederate soldiers who served under Lee gave him their undying loyalty and many historians feel that this day at Gettysburg, as tragic as it was, may have been his finest hour. Recommended Reading: Pickett's Charge--The Last Attack at Gettysburg (Hardcover). Description: Pickett's Charge is probably the best-known military engagement of the Civil War, widely regarded as the defining moment of the battle of Gettysburg and celebrated as the high-water mark of the Confederacy. But as Earl Hess notes, the epic stature of Pickett's Charge has grown at the expense of reality, and the facts of the attack have been obscured or distorted by the legend that surrounds them. With this book, Hess sweeps away the accumulated myths about Pickett's Charge to provide the definitive history of the engagement. Continued below.